March 14, 2019: Marathon week 2! 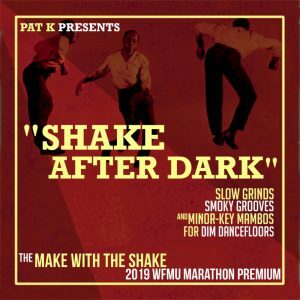 Pledge $75 or $10/month tonight and get a copy of the exclusive Make With The Shake premium CD Shake After Dark! Plus you'll get in the running to win any of the sweet prizes I'm giving away tonight! Keep WFMU & Ichiban alive! Hi Gina, thanks for stopping by! Thanks to everyone who's pledged already! And if you haven't pledged, do it now and win some prizes! Loosen Up, Tighten Up, all good. I wonder if there's enough "Tighten Up" imitations out there to make up a good comp? It's such a good groove. I prob have at least six versions, so there’s a start! And I still say the Benny Gordon version slays!!! Haha it's a good one! That'd make a fun premium, maybe next year. Ahhh - I just noticed you’re talking about derivatives of TU... there’s gotta be a ton!!!! Gotta be! Even Archie Bell himself went back to the well a few times! Let’s do it, DJ P! Gina! You’re the reminder person!!! Please!!! I'm glad Nashville is showing up with the pledges! Hi! Bob’s wife, Mary-here. Love. This.Show! Hi Mary! Glad to hear it! Thanks for tuning in! hay Pat hay errybody been lovin the show! Hey, Mary! Hey, Melissa Jean! Hi Melissa, thanks for stoppin by! BIG THANKS to pledgers Nicole T, Matt T, and Janos C!!! Thanks for a fun show, DJ Pat K! Night, everyone! Thank you, DJ P! Awesome as always!!! Thanks all for tuning in! Always a blast sharing these tunes with everybody!